Discover the scent that launched a thousand copies. Soft, woody and warm with uplifting citrus top notes of lime and bergamot – our best-selling Silhouette Heart Candle evokes feelings of peace and tranquillity. Hand-poured into a beautiful silver-plated, heart-topped jar and supplied in a luxury presentation box, this item is an ideal gift for loved ones who will enjoy up to 50 hours of burn time and long-lasting fragrance. Many have tried to replicate the classic fragrance of the Silhouette Heart Candle, but none have succeeded. Fill your home with the original and long-lasting soft aroma of our best-selling fragrance and discover this classic soft and woody scent for yourself. Warming woody aromas erupt from the pretty candle, filling your home with an alluring and comforting scent. The fruity top notes of the scent cut through the wood perfectly, offering hour after hour of revitalizing fragrance and joyous warmth. 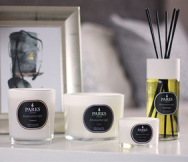 Made from the finest natural waxes and soot-free wicks, this perfectly blended scented candle will gently infuse your home with uplifting notes of lime, citrus and bergamot – a truly distinctive scent. Few candles can elevate the atmosphere in a room so effortlessly. This Silhouette Heart Candle is hand-poured into a beautiful silver-plated jar and comes in a luxury presentation gift box, making it a perfect gift for family and loved ones. This candle truly smells as good as it looks and is certain to take pride of place in any home.